You may wonder why there is a large difference between what LendingClub advertises as "Net Annualized Return" and my self calculated account APY. I believe the principal reason for difference between these two is that LendingClub's calculations do not factor in FolioFn fees and loan losses incurred when selling loans at FolioFn. 1. Multiple years of lending at Prosper before opening my LendingClub account. I lent about $5500 over several preceding years at Prosper and had a net loss of $50. Over my time at Prosper, I learned a few lessons about risk-return. I no longer use Prosper. 2. Over 90% of loans originated are to borrowers whose projected revolving debt balance (after loan) is no more than three times their income. This requires one to trust the marketed loan purpose at face value... (e.g. debt consolidation loans end up being used 100% for debt consolidation). 3. 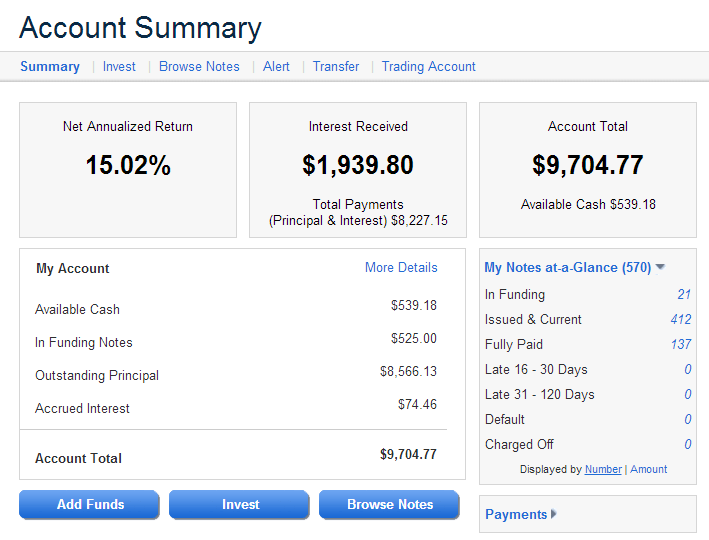 Most of my loans are to borrowers reporting over $3000 per month for income. I feel that the these borrowers have a greater latitude for paying basic living expenses and then having room in their budget for debt payback. 4. I have ALWAYS sold non-performing notes. Over 90% of the time, I sold notes that were no more than 15 days late in payment. Most of the time between 2009 and Nov 2012, I sold notes in the hours between the time I discovered their monthly payment was was late and the time at which the note changed to an "in grace period" status. 5. In November 2012, I noticed that the FolioFn trading platform was performing poorly and not displaying notes very well when users attempt to sort notes by Yield to Maturity. Because of this, a number of my notes "in grace period" did not sell very well. While I experienced some short term disgust with the FolioFn platform, it did prompt me to start selling notes well prior to them entering "in grace period" status. Now, a majority of the notes I sell are those notes that have had a greater than a 35 point credit score drop since the loan was originated. I typically sell these notes for around 0.99 to 0.995 cents on the dollar and eat the additional 1% FolioFn fee. I would rather sell loans prior to a delinquency than have them age to an "in grace period" status and have to deal with the inadequacies of the FolioFn note trading platform. If FolioFn is acting up (as it has in the past), it could cause notes that would normally sell to age and result in delinquency statuses of 17+ or 31+ days. Notes that age to delinquency statuses of 17+ and 31+ days have required me to discount them 25-75% in order to get them sold. Is My Retirement Goal Attainable? Under Current Assumptions, We Fall Short Unless We Invest More in LendingClub Peer-to-Peer Notes. The banner on my website clearly states a goal of mine to retire in 2025 with passive income in the amount of $125k per year. Since 2004, this goal has shifted from retiring at 47 years of age to 51 years old. I made this shift on my banner around 2010. My earlier aggressive goal was likely based on a confidence in the real estate market in 2004. That confidence in real estate remains, but now to a smaller extent. To retire at 51 years of age, I assume that I serve 29 yrs in the military and retire as an O6. This is a big assumption in that this would require a promotion from O5 and my wife to tolerate another 12 and a half years of my service. I believe the is not that much of a stretch since we are getting to the point where she will homestead and most of my follow on assignments are likely possible in the DC beltway (where wife wants to homestead until I retire). Assuming I make it to 29 yrs of service and retire as an O6, I should net $64,109 per year after taxes and survivor benefit premium payments. The wife is civil service and if she homesteads after our next assignment and stays in her current line of work, we're looking at an additional $7,023 per year for her pension after taxes and survivor benefit premium. We have three investment properties now, two of which are paid off and another one that will be paid off within the next 20 months. In 20 months, these properties will be bringing in a net of $15,463 a year after taxes, insurance, maintenance and management fees. Now, this leaves a passive income shortfall of $38,405. A retirement at 51 yrs of age does not permit including distributions from 401Ks and IRAs. We do not save a lot into these investment vehicles because we have been focusing on paying off real estate and generating free cash flow. At the age of 51, we should have about $290k or more in these retirement investment vehicles assuming a conservative 4% annual return rate. Now, what other assumptions are we making and where do we think we'll end up in meeting our goal of $125k in passive income? We are saving $600/month in our dividend reinvestment plans. Assuming a 8.4% annual return, we are projected to accrue $233,387. Assuming our current portfolio dividend rate of 2.6% remains the same, this would bring in about $5,158 per year after taxes. We are also projected to invest $4k this year and $2k in each subsequent year in LendingClub peer-2-peer notes. Over the past four years, we have netted a 45.85% return before taxes at LendingClub. In our first year, we netted 7.7%. In 2012, we netted 10.98%. 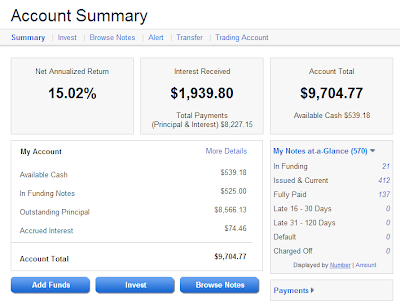 Assuming an optimistic 12% annual return, we should end up with about $103,637 in this account. In 2025, this should give us about $8,208 per year after taxes. This leaves a shortfall of $25,039 per year. We project that we'll have the ability to accrue an additional $529,227 in savings by May 2025. Assuming we spend $400k on a condo in Northern Virginia and later convert it to an investment property, this should net us about $12k per year in income after management, home ownership association fees and taxes. If we retire in May 2025, we will fall short of our goal, somewhere between $2,800 to $10,813 per year. How will we make up this goal? If we execute course of action #3 and work an additional four months investing those earnings in additional LendingClub notes, we could meet our goal and retire in September 2025. If we execute course of action #1, it would take an additional three years of work to accrue a 2.6% dividend paying portfolio large enough to fill the income gap. I'm only assured an additional year of service since O6s are required to retire at 30 years of service. If we execute course of action #2, we could likely attain our goal but it would require us to retire one year later in 2026 and roll all subsequent earnings into a combination of LendingClub notes and stocks. I have been on Lending Club since Dec 2008. 2009: 7.7% return. One month with a losing record. 2010: 9.5% return. Zero months with a loss. 2011: 11.0% return. Zero months with a loss. 2012 thru 30 Sep: 9.6% return. Zero months with a loss. I personally believe that I have not lost money in Lending Club because I do not hold loans until default. Instead, I sell the loans at a discount in the first two weeks of loan delinquencies. 1. According to Ilian Mihov, a professor of Economics at the INSEAD business school, Italy will have to refinance what percentage of its total debt in 2012. 2. What major government official told a news conference on Thursday that the United Kingdom is preparing itself for a wide range of European financial crises? 3. According to a new report, how many days delinquent is the average housing loan in foreclosure?